The Lost Dutchman Arizona 8K Trail Race is held annually over President's Day weekend as a part of the Lost Dutchman Marathon. 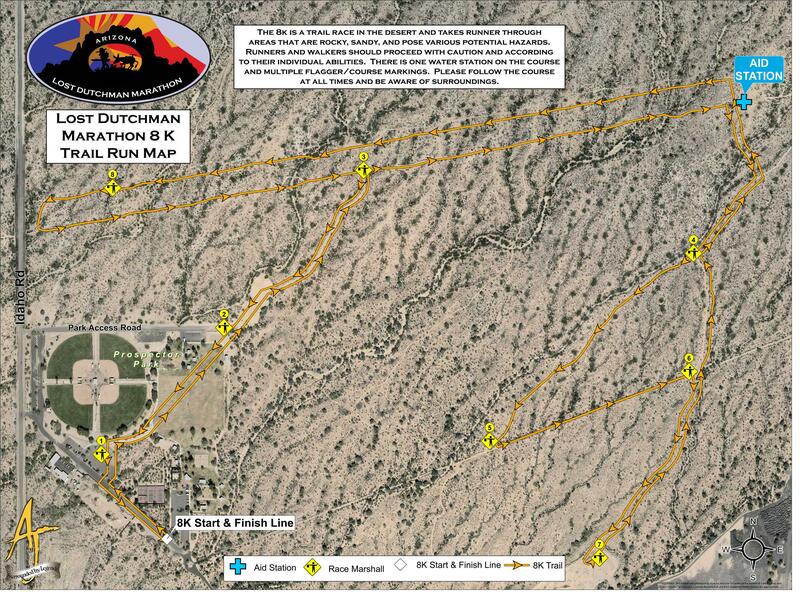 Course: The 8K is a desert trail run starting and ending in Prospector Park. The course is mostly on dirt trail in the northern and eastern portions of the park that is undeveloped. The only elevation changes are where the course crosses dry washes, otherwise the course is flat. It should be considered relatively easy as trail courses go. If you are looking for a really fun trail run, this one is worth considering. There is no time limit for the 8K race. Course map. Registration: Registration Details. Registration for the Lost Dutchman 8K Desert Trail Run is available online, by mail or in person near race day space permitting. Register today at Athlinks. $85 $95 $110 $120 400 7:00 a.m.
$75 $85 $95 $105 1100 7:15 a.m.
$45 $50 $55 $65 800 8:00 a.m.
$45 $50 $55 $65 800 7:45 a.m. Registration Limit: Participation in the Lost Dutchman 8K Trail Run is limited to 800 runners in 2020. Parking: The race begins and ends at Prospector Park in Apache Junction. From US 60, you may use Tomahawk road and park in the Rodeo grounds or exit at Ironwood and park on the north side of the park. Visit our Driving, Parking & Transportation page for detailed race parking information. Aid Stations: For the 8K trail race there is one aid station that all runners will pass twice. Packet Pick up: Race Packets will NOT be mailed. Thursday February 13, 2020 runners can pick up their packets at Road Runner Sports - Tempe, 43 S McClintock Dr., Tempe, AZ 85281 (Map) from 11 a.m. till 7 p.m.
Friday, February 14, 2020 at the Lost Dutchman Health and Fitness Expo in the Multi-Generational Center, 1035 N. Idaho Rd. Apache Junction, AZ from 3 p.m. to 7 p.m. (Map). Saturday, February 15, 2020 at the Lost Dutchman Health and Fitness Expo in the Multi-Generational Center, 1035 N. Idaho Rd. Apache Junction, AZ from 8 a.m. to 5 p.m. (Map). NON-MARATHONERS can also pick up their packets Sunday, February 16, 2020 at Prospector Park 3015 N. Idaho Rd. Apache Junction, AZ beginning at 5:45 a.m. NOTE: There is no day of race packet pick up for the full marathon. Marathon runners MUST pick up race packets Thursday, Friday, or Saturday. As a last resort, all unclaimed bibs will be held at the Rodeo Grounds marathon bus loading on race morning. You will be able to claim a tee shirt after the race, the size is not guaranteed. The race will be chip timed. Your chip is a part of your bib, do not remove it. Your number bib must be worn on the front and be visible at all times during the race. You may have someone else pick up your race packet. Medals: All 8K finishers will receive a commemorative medal. Awards: Awards will be presented to the top three male and female finishers in each age group. Age groups are 10 and under, 11-14, 15-19, 20-24, 25-29, 30-34, 35-39, 40-44, 45-49, 50-54, 55-59, 60-64, 65-69, 70-74, 75+. Results will be posted as soon as possible after the completion of the race. The awards ceremony will be held as close as possible to 10:15 a.m. If you win an award, be sure to pick it up before leaving. Award recipients not able to stay for the awards presentation can still receive their award, details are on the awards page. I enjoyed the 8k with flat ground, sand and rock below my feet. The sunrise through cactus was magical. I have participated in the 8K trail race for the past 4 years. I love the course (not too tough) and how accommodating it is to both runners and walkers. The volunteers are so nice. I have already registered for next year! I have been wanting to run this race for years and finally! The folks at packet pickup were friendly and helpful with a very simple & fast two-step process. Race day was a chilly 41 degrees with little to no wind, thankfully. The 8k trail was fun with some very small rolling hills, running on asphalt, grass, hard ground and sand. I took one of my favorite pics of the sun behind clouds, desert and the Sups in the background. AJ is truly beautiful! Post-race snacks - banana, oranges, chips and bagel. Thanks for a great first experience! I ran the 8K trail run and was thoroughly impressed with how well-organized and FUN it was!